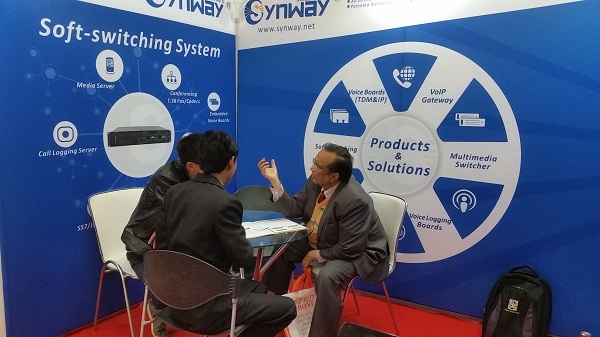 January 23rd, India --- Synway, a leading designer of Telecom hardware and IP communications attended Convergence India 2015 with its state-of-the-art VoIP products and solutions. Together with another distributor VoicNetwork, Synway achieved huge success and won tons of approval from coming visitors. As South Asia’s largest telecommunications exhibition, Convergence India is causing growing concern internationally. During the three-day show, Synway team definitely took great efforts to provide the most satisfied and professional services, like they always do. To better cultivate India market, Synway add one more distributor into its channel partner list. “We have absolute confidence in Synway products, especially their newest VoIP gateway, which deserves all-around attention. We feel honored to have the chance to cooperate with Synway and will do what we can to push their gateway business to a new level here” said Amit Kumar, product manager at VoicNetwork. About Convergence India 2015Themed as Connecting India, 23rd Convergence India 2015 Expo, largest South Asian platform for Telecom, Broadcast and Digital Media, attracts over 15,000 massive business visitors, and participation by 400+ companies from 30 countries. Convergence India 2015 Expo provides a remarkable opportunity for many visitors to experience latest technologies, knowledge sharing sessions and views shared by some of the key global leaders.